How to set up a system of Communications between all parties on the construction project. In his twenty-five years in the construction industry, Leonard Brunotte has managed and controlled construction projects of every size and type. He is an acknowledged expert in a wide range of technical construction and management areas including engineering, purchasing, scheduling, project supervision - as well as bid, risk, money and collection management. The holder of an MBA degree with additional concentrations in marketing, finance and international business from Loyola University of Chicago, Mr. Brunotte is currently president of Deerfield Consultants & Associates, Inc., a management consulting firm specializing in providing profit management solutions to the construction industry. No opportunity will be lost due to an oversight or forgotten detail. Illustrates the positive and negative variations of a typical budget for a period of one year. For use in cost estimation, documentation, record keeping, these forms have been job-tested for relevance and effectiveness. This detailed recovery claim is a real-life case of what was done to receive full payment from a delinquent client. You can use this claim as a working model to prepare you own effective recovery claim. "Mr Brunotte has some sound advice on how to say profitable in the turbulent world of the construction contracting industry and tells it all in a style that is, at the same time, entertaining and instructive." "Mr Brunotte has written a lively, forceful, comprehensive, and useful treatise on the business of contracting. He offers cogent presentations of business theories, of practical realities, and of ways of surviving and flourishing in the construction industry. In short, Mr. Brunotte has created a bible for profitability in contracting." "Most rewarding for contractors. 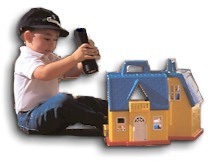 Covers the present day problems peculiar to today's construction industry. Mr. Brunotte's procedures help contractors avoid a variety of construction problems." "So your last job was technically superb, but the bottom line was in the red? Leonard Brunotte has compiled a complete guide of current financial tools for the construction oriented contractor. He covers methods to increase profitability in your construction firm." 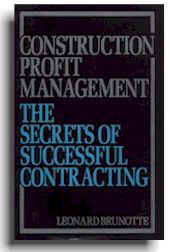 "Leonard Brunotte's practical guide to profitable construction management is an excellent work. This valuable tool helps contractors identify problem areas and resolve them through a uniquely-tailored program. I highly recommend." "Leonard Brunotte provides a sound approach to the claims problems facing construction contractors. Using a set of excellent cases, Brunotte offers a practical framework for successful contracting management."